There is a common story that airline ticket prices rise significantly if you buy them less than two weeks before departure. And that any time before that will yield standard prices. Is that advice valid for flying during holiday seasons? As an example: if I want to fly coast to coast USA on December 7th, must I buy my ticket ASAP, or would I get a similar price buying on November 21st? TL;DR: If you know you're going, and there's a fare you can afford, book it. Waiting will almost never save you money, and never enough to offset paying double or triple the cheapo fare because you waited too long. Detailed explanation, with pictures: The problem is that there is no single "the price" that goes up and down. On any given flight you can buy as many as a dozen different tickets, each at a different price. They carry different privileges -- eligible to earn frequent flyer miles, lower change fees, lounge access, seat selection included, less credits needed to upgrade, free meal, etc -- depending on the airline. Often, some or all of those privileges mean very little to you and you will just buy the cheapest one. When all of the absolutely cheapest ones are gone, you have to buy the next most expensive class, and that means you will pay more. So how do prices go up? By the cheapest seats getting bought. How do they go down? By those seats being cancelled and returned to the pool (unlikely, since they have high change fees and are bought by people who have firm plans), by discount codes or overall "seat sales" being issued, or by seats being moved from one class to another. That last thing is called "yield management" and it is what some very smart people do for a living. They don't want a plane to go out with an empty seat (getting $0 for it) but they don't want to sell it to you 3 months in advance for $200 if somebody with an urgent need to travel would pay $1500 for it the week of the flight. So they might decide to move an unsold seat from the $1500 fare class to the $200 fare class, but only if they are sure that's the only way they'll sell it. You can see that they can go out with an empty seat 5 times, and the 6th time sell the seat for a premium, and still be ahead overall. They are pretty good at guessing how many "urgent needs" are likely to arise in a given week. And trust me, the holiday season is rich in "urgent needs". The chances of cheaper seats being available right when everyone wants to fly are slim to none. You can see that already, on many of the flights, all of the Tango fares are gone. There are clearly two prices for Tango, and only one flight has the cheaper one left. Similarly there are 3 prices for Tango Plus. And so on. 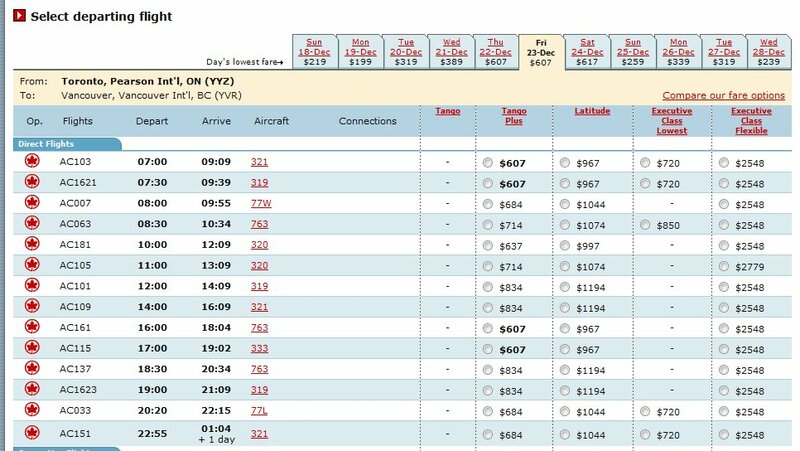 As it gets closer and closer, fares will disappear from some flights. Over time, you can get familiar with the patterns between two cities. 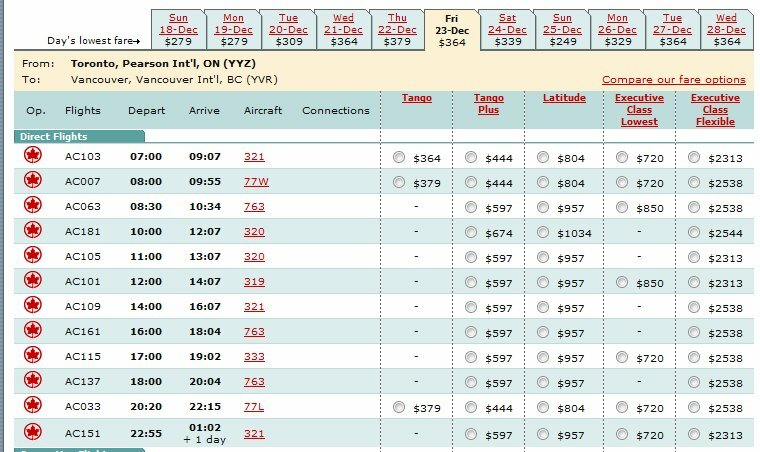 You might notice that the 7am flight is alway last to lose its cheap fares, and wait till you see a pattern like this one before you buy. As always, it helps to be unusual. If you prefer a flight at a time of day most people don't (like 7am) you can pay less. If you aren't trying to fly the Friday before Xmas, you'll pay less. And so on. But look at the difference between Tango and Tango plus here. 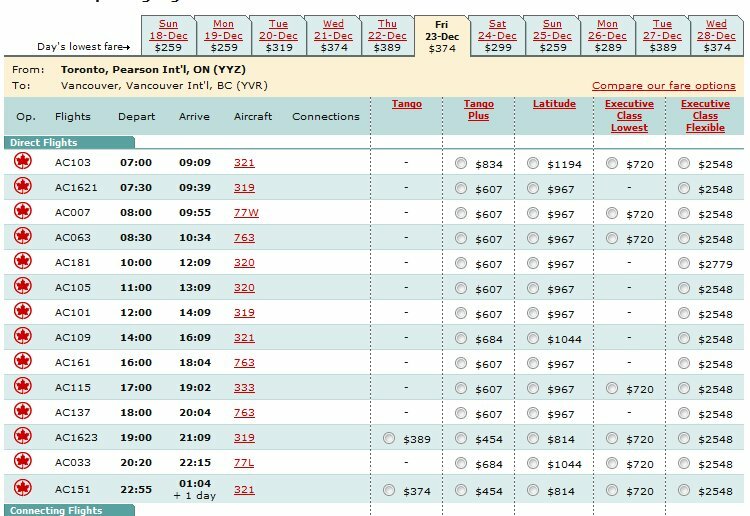 When all that's left is $597 fares on every flight, they can have a 20% off sale and bring it down to $477 - but you would have been better off with $364 in the first place. If you know you're going, and there's a fare you can afford, book it. Waiting will almost never save you money, and never enough to offset paying double or triple the cheapo fare because you waited too long. Every flight has gone up dramatically, except (for some strange reason) for the last flight of the day. Waiting a few weeks to book would have cost you hundreds of dollars. Now it's really awful. The cheapest is $607, in fact some of the economy classes now being sold cost more than sitting in business class would cost! Again let's advance to some point as far away from now as Dec 23rd was when I started this. Say Jan 23rd. Wow! Now some flights are as little as $199! Notice also that there are two less flights on Jan 23rd than on Dec 23rd. 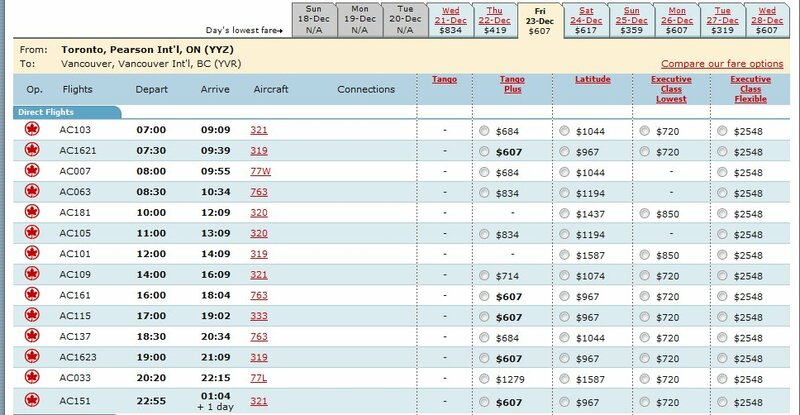 The airline has added as much capacity as it can for the route on the popular day - the tickets just keep getting bought! Update Dec 16th: So now it's less than two weeks to that Dec 23rd flight home for Xmas. What bargains has the waiter achieved? The lowest possible price is still $607, so there hasn't been much lost by waiting. And that last flight of the day has become cheaper somehow. 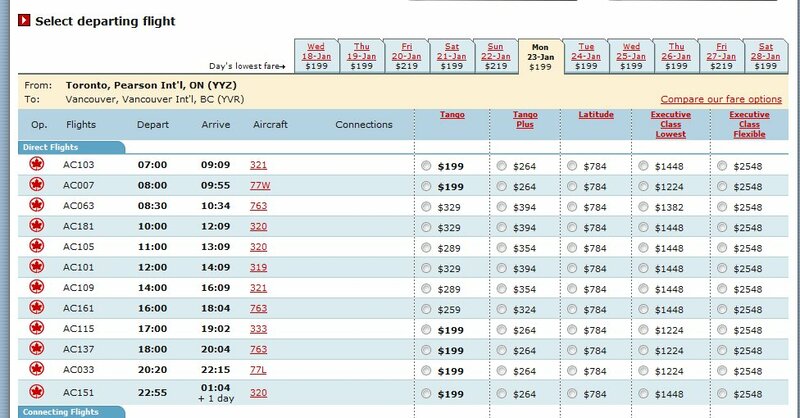 Some particular flights are cheaper (the noon flight has gone down $100) than they were Nov 24th. But they are ALL far more expensive than they were in late October. I think for the case of Xmas, if I had a time preference, having left it to one-month-before I might try to gut it out to two-weeks-before in the hope of getting my preferred time. But the smart thing to have done was to book two-months-before, or more. $607 might look good compared to $1279 (all these prices are one way before fees and taxes) but it's actually brutally high considering you would normally see $199 or less one way before fees and taxes for that city pair. Remember, too, that this is not the airline ripping you off because it's Xmas. They always had $604 tickets and $1279 tickets on sale for every flight every day. Normally speaking, people don't buy those tickets. That's the difference. Other people beat you to the $199 ones. Update Dec 21st: I think this is as last minute as anyone would dare. How are we looking? The cheapest price has not changed, it's still $607, and there are still 5 times of day you can get that price, though they have swapped around a bit. Some people REALLY needed to fly today, I guess. There doesn't seem to be a clear pattern - I think it depends on the demand for the tickets for a particular day. My best guess is that they manage to sell more tickets than expected (at a given time to departure) than the price goes up, and if less than it goes down. In general I think the cheapest way is to find some promotion for the tickets (you need luck here I guess). Then I heard from someone that the optimal buying time before flight is 6-8 weeks, but again I haven't seen any evidence. 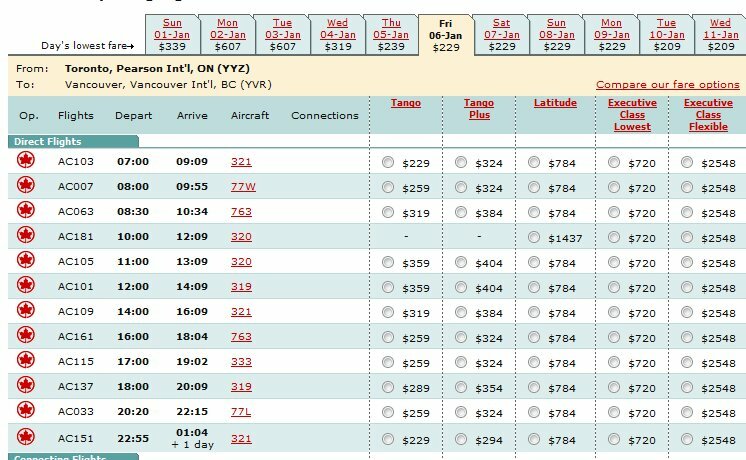 In my experience with flights within Asia, and also trans Atlantic and Pacific flights from North America, yes, flights are cheaper 2 weeks or more before your date. However, it is helpful to search for flights and prices for the route you are interested in way before you plan to buy. The reason for this is to get an idea about what a "base" price will be against which you plot the price you are willing to pay, rather than what the cheapest fare the airline/search site offers. So, from my city to Chiang Mai Thailand, I discovered that on average 650 dollars would get me to either Shezhen, Guangzhou, or Shanghai, from which I could get flights to Bangkok/Chiang Mai. I also discovered flights to Hong Kong were actually 350 dollars. But for some reason at that time flights between HK and Thailand were more expensive than flights departing from within China. So I resigned myself to approximately 700-1000 dollars to get to Chiang Mai. Various other sites, routes, and airlines were all within that window, and that price was for departures 2 weeks from any given day I was searching. Flights even a day sooner, or later, than two weeks from the date I was searching, pushed the base price to 850 dollars. Then all of a sudden a China Eastern flight popped up for the dates I wanted to fly, but 40 days before I would fly, and the fare was 440 dollars, all the way to Chiang Mai (on chipmunk.com). I didn't hesitate to buy that. Maybe it would be cheaper, BUT, compared against the base rate I was finding, it was substantially lower, now. So I bought it, and in this case, that price lasted about a week and then shot up like all the rest. I know it wasn't the cheapest ever, but I consider this to mean I saved 400-600 dollars, based on knowing on average what most flights were costing. Try many different airlines, search sites, origin of flight, etc. A few major points: the person who did this neat little comparison - nice job by the way - looked on all different days of the week. Oct 23rd and Nov. 7th were Wednesdays, Nov. 24th was a Thursday, and Dec. 16th was a Friday. It's well-known that tickets prices change, often dramatically, during the week. They are generally lowest Tues (sometimes also Mon and Wed) and gradually rise to highs on Fri and Sat. It would be more efficient to compare the price always on the same day - so always on a Tuesday but different weeks, for example. Secondly, it makes little sense to say "the Dec. 23rd ticket might have cost $229 if I have booked it Oct. 23rd" based on the reasoning that "now it's Nov. 23rd and the price of a Jan 23rd ticket is $229." A Dec. 23rd ticket will likely to be higher than a Jan. 23rd ticket no matter WHEN you book it. Even if you book it in January of the previous year, it's just more expensive to travel around a holiday because there is more demand at that time (i.e. airlines can get more money for those tickets). It's not just about the span of time between when you book and when you fly. Actually, one of the best tips for securing a plane ticket at a low price is to AVOID the holidays - problem is, that's when most of us want to (or are able to) travel! Thus, the supply-and-demand nature of this aspect of flying holds more control over the price than the period of time between when you book and when you fly. I think there isn't a general answer. Generally, the prices raise slowly and then they drop shortly before the departure, but only if the plane doesn't get full. So it is more or less a game. If you think the tickets won't be sold out I would wait for the very last moment. Otherwise I would save the ticket as soon as possible. Since you're traveling in the holiday season I would rather chose to be on the safe side and book the ticket as early as possible. ticket prices change wildly in the period prior to a flight. They can go up, but also down. Usually they are very several months before flight (most airlines open bookings 6 months to a year before flight departure), go down to a bottom maybe a few weeks early, up again to a day or two before departure, then down again as the airline scrambles to fill the last few seats. It's all a combination of risk, convenience, and opportunity. If you can afford to miss a flight, you could wait until maybe a day before departure and try to get a dirt cheap ticket. If you MUST catch that flight, you might want to book half a year in advance. As cheaper booking codes / fare classes are sold out the remaining seats typically have higher prices. With planes flying so full lately (especially during the holiday seasons), it tends to be a good idea to book early. When looking for a good fare one can try to determine what the average fare is (e.g. at sites like flightrouting.com) to be able to tell if the fares that are available are better than what's typical for that route. In the holidays it seems that it would be best to book earlier than just two weeks, especially as some flights may completely sell out. Not the answer you're looking for? Browse other questions tagged air-travel budget tickets seasonal or ask your own question. When to buy plane tickets to get best rates? Are the prices of short-haul British Airways flights known to fluctuate (within the Economy class), or they only ever increase? How far in advance is it recommended to book flight tickets? 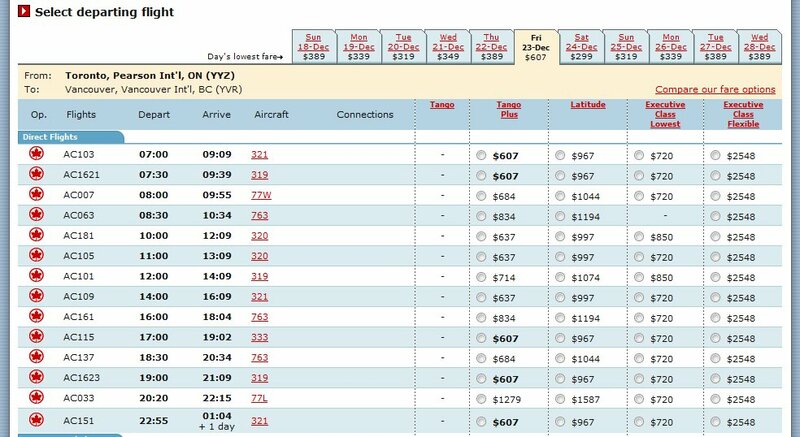 How far in advance should you book a domestic flight within Canada for best value? Does browsing ticket sites in incognito mode and/or from different IP's result in cheaper ticket prices? How do you know if you have found the cheapest air fare on a given route? What are some tricks you use to buy cheap airline tickets in Europe? What is the cheapest travel destination in Central/South America (from Chicago)? How/where to buy mixed-class tickets for a flight? Can I buy two one way tickets for a trip? Why do (a lot of) people book airline ticket through agencies?